This past week, in preparing a radio program featuring the final recordings of Ali Farka Toure, I stumbled on an unusual tape that I immediately wanted to share with you all. Have you ever wondered, when listening to Ali Farka Toure’s CDs, what it would be like to just hear him play-not trying to nail the perfect studio take, not for a concert audience- but just playing, taking his time and letting the music unfold? I have, and this recording is probably the closest I’ll ever come to satisfying my curiosity. I found this cassette in Bamako, back in the summer of 2003. I was in Mali for a few weeks and was staying in a hotel that was a couple of miles south of the city center. In the early evenings, after my working day was done, I would unwind with long walks through the neighborhood. On my second evening, soon after sunset, I walked through a bustling market and was attracted by a beautiful kamelen ngoni recording. I soon located the source of the music; a small market stall attended by a man in his early twenties who was standing between two rows of wooden cabinets, each containing dozens of drawers. As we spoke, and I asked about different styles of music, the young man pulled open drawer after drawer, laying out cassettes, each one more interesting than the next. The young man explained to me, as the music played, that his father had been a Radio Mali engineer for many years, and had collected, from a variety of sources, thousands of rare recordings. For a few dollars a cassette, he said, he could duplicate any of these recordings for me. I had a dilemma. I was leaving Bamako in a few days and had already bought a few hundred cassettes at the Dabanani market in downtown Bamako. How many more cassettes could I fit into my luggage and more importantly how many cassettes could the young man duplicate for me in three days? He was confident he could get one hundred titles duplicated. I was dubious, but desperate enough to take a chance. Over the next three hours, of listening to fifteen seconds from hundreds of different titles, we selected a hundred cassettes that he would copy for me. I paid half up front, and we agreed on a time that Friday when I could swing by to collect my recordings. When I showed up on Friday I was thrilled to find a stack of ten cardboard boxes, each neatly labeled and wrapped for me. Over the last five years I have taken my time going through these recordings and have yet to be disappointed. The cassette in this post features Ali Farka Toure accompanying the ‘Nightingale of Tomboctou’, Khaira Arby. This is a recording of an intimate evening of music, made back in the mid 1980s. 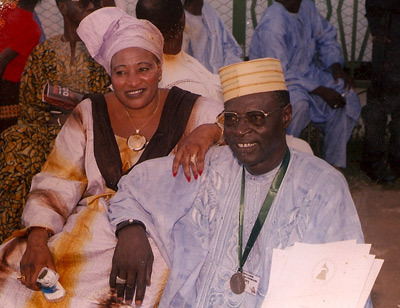 Ali Farka Toure and Khaira Arby were invited, by Moulaye Haidara, the then governor of the Ségou region (he served between 1983 and 1987), to play, for his family and a small group of friends, in the governor’s mansion in the city of Ségou. Most of the songs on this cassette are Khaira’s compositions and Ali, for the most part, just kicks back and rocks the guitar. Khaira Arby was born on September 21, 1959, in the Abaradjou neighborhood of Tomboctou, to a Berabiche father and a Tamachek mother. The only singer in her family, Khaira started to perform, in 1970, when she was only eleven years old. She made her public debut with a cultural group from Abaradjou, and made such an impression that she was soon recruited by the ‘troupe du cercle de Tomboctou’. And later that same year, she was promoted to soloist with ‘troupe regionale de Gao’, the ensemble with which she appeared at the 1970 biennale; a biannual music festival/competition featuring the best traditional and modern ensembles from throughout Mali. In 1972, Khaira was recruited by the ‘Orchestre de Tomboctou’, a modern dance-band, and two years later, in 1974, was selected to represent Gao in Bamako, for the final round of the biennale. Khaira was awarded the third prize for best vocal soloist. Her blossoming music career was cut short, however, in 1976, when her father, frustrated that Khaira had abandoned her studies for music, forbid her from performing in public. Khaira obeyed, quit the ‘Orchestre de Tomboctou’, stopped performing, and got married. 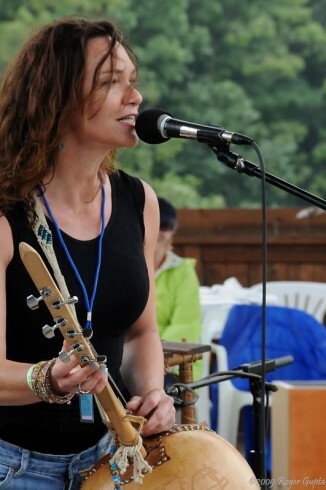 Seven years later, after her divorce in 1983, Khaira started to get pulled back into music. After leaving her husband, she moved back to Abaradjou, where she was soon asked to manage a neighborhood cultural group. Khaira organized the ensemble and spent several months working, in particular, with a talented young female singer. On the evening of the group’s debut performance, an unexpected turn of events pushed Khaira back in front of the public. Several hours before the group was to take the stage, her young protégé told her that her father would not let her sing in front of an audience. Faced with no other choice, Khaira was forced to take the stage; this fateful concert kicked off the second leg of Khaira’s career. In 1990, after working for a time in Bamako with Harouna Barry and the ‘Orchestre Badema Nationale’, Khaira released her first cassette ‘Moulaye’. Three years later, she released ‘Hala’, recorded with her own group, and then in 2002, released her masterpiece ‘Ya Rassoul’, which in my opinion is one of the best Malian cassettes of the last decade. Khaira, who still lives in Tomboctou, has been very busy over the last few months. In early February, she was invited to Bamako’s Studio Bogolan to record three tracks with the American group ‘Sway Machinery’, and later in the month was back in the same studio, this time with her own group from Tomboctou, laying down the tracks for her upcoming international debut. And, according to her producer, Khaira’s North American fans can look forward to the ‘Nightingale of Tomboctou’ making her US debut sometime in the fall of 2010. The cassette starts with a formal introduction by Ali. He says, ‘Peace be upon all of you, this evening we are in Sanda, a neighborhood of Segou-Sikoro, the capital of the 333 Balanzans (a Balanzan is a Shea tree). Thanks to all of you who had a role in inviting us here to perform this evening. This is a memorable event for us, and we are blessed to be among so many renowned and honorable people’. And with that Ali hands things over to Khaira. This first song is called ‘Yacoumana’; it is a song that is frequently performed at ‘Arab’ weddings in Tombouctou. (A brief aside on the term ‘Arab’ in the Malian context: ‘Arab’ refers to nomadic tribes in the Azawad, or Malian North, who speak Hassaniya, the language spoken by the Arabo/Berber population of Mauritania. These ‘Arabs’, or Berabiches, are distinct from the ‘Tuareg/Kel Tamashek’ nomads of Berber origin, with whom the Malian ‘Arabs’ nonetheless share many customs). Khaira sings, in her native ‘Arabic’, of the glories and beauty of Mali. This is the song that Khaira’s young protégé was supposed to sing on that fateful night in Abaradjou, back in 1983. Ali Farka Toure starts this song off, before handing the vocals back to Khaira. This is another classic from the Malian ‘Arab’ repertoire. It is a praise song called ‘Yalali’, which the singers use to extol the virtues and ancestry of the patrons who have invited them to perform. Next up is a song in the Sonrai language that calls on all Malians to come together, and work for the glory of their country. ‘Without national unity’, she sings, ‘nothing is possible. We are all brothers and sisters, and we must come together and fight for Mali’s future’. One of Khaira’s most famous songs is ‘Aigna’, or ‘My Mother’. Composed shortly after her mother passed away, Khaira sings, ‘there is nothing eternal in this world. Look behind and you will see that everyone passes away sooner or later’. 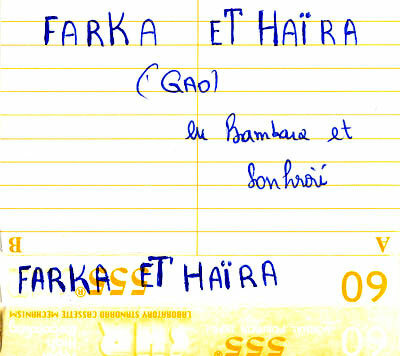 This song, which Khaira has rerecorded for her forthcoming CD, is the one that gave her the opportunity to represent the Gao region in Bamako, at the 1974 Biennale. This final track is called ‘An Dunya’, or ‘The World’, and it was composed by Ibrahim Hamma Dicko from the town of Gao, in Northeast Mali. Khaira sings, ‘you see how the world is changing. Life is strange. Slow down and look at all that we have left behind. Think about what we are losing. The world is strange’. This post is based on an interview with Khaira Arby. Many thanks to Moulaye Haidara of Radio Aadar Koima, in Gao, for his help with translations, and to Boris for the beautiful picture and details on Khaira’s upcoming album and US tour. I just got off the phone with Khaira Arby and will be updating this post very shortly. Thanks for this wonderful gift, there are also a video of two or three songs that my Sonraï friend showed me,that I think belong to this event. There is also Hamma “Pedro” Sankare playig calabash. would be very satisfying to have a slightly higher mp3. Could we have it, please? And very happy with a new relase of Khaira, I never tire of listening again and again ‘Ya Rassoul’ Mali K7,and sometimes the tape ‘Moulaye’ (I think in honor of his guitar player). At last I know what is a Balanzan,thank for this too. But not the Shea tree. The English name “shea” comes from sí, the tree’s name in the Bamana languages of Mali. The French name “karité” comes from ghariti, its equivalent in the Wolof language of Senegal. Thanks for the info. on Hamma Pedro Sankare and the detailed info on the Balanzan tree! Thank you for sharing this amazing find! I am working on the North American tour for Khaira. So far we have dates in NYC, Madison WI, Albuquerque New Mexico and Annandale, NY. I will keep you informed. We also have the new CD hopefully ready for release this summer. Let’s keep in touch. Thanks again for this great research! Listening to this is such a joy! I was in Mali in January with my band The Sway Machinery performing and recording with Khaira. In my opinion she is one of the great living vocal talents. It’s amazing and frustrating how limited access to her work is in the West…hopefully that will change soon! I’m so pleased that this early work of hers is available. A treasure indeed!